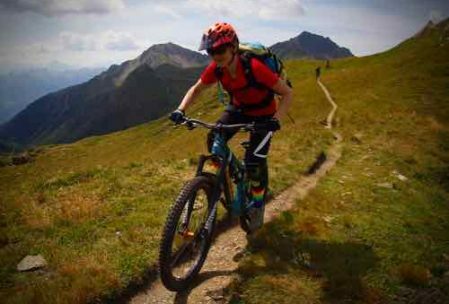 Alps Mountain Biking Holiday like no other! 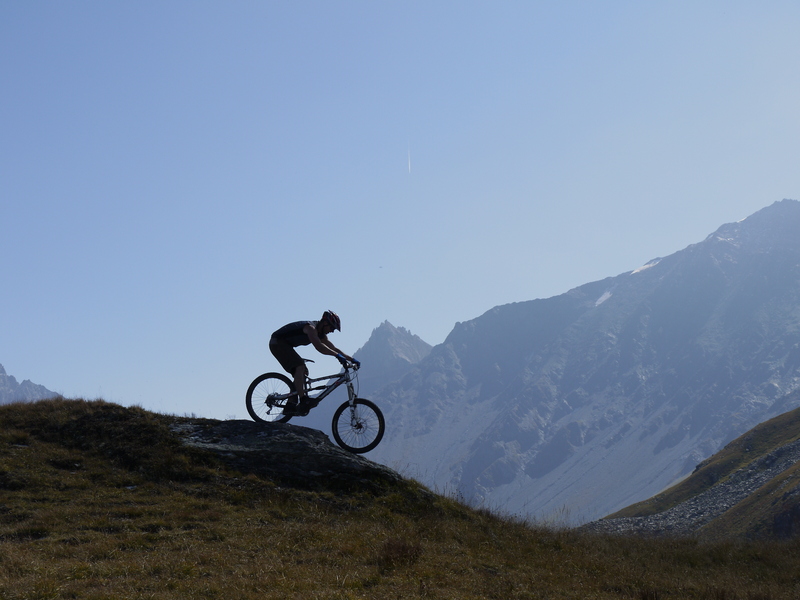 Epic holidays on the most incredible mountain biking trails in The Alps – that’s what we love. Stunning Alpine mountain biking days! The chairlifts help during July and August. We use our uplift van in June and September. However, BikeVillage doesn’t just run laps of resort trails in The Alps – we like to head off into the mountains in search of truly inspiring mountain bike single track adventures. 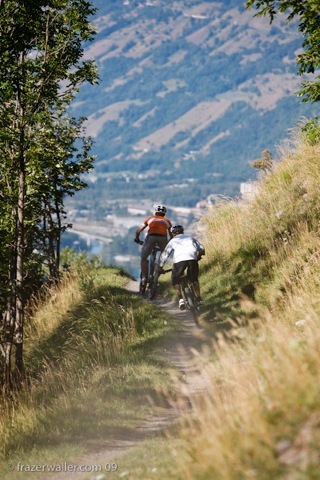 You’ll still be pedalling some to reach the best riding, the best views and the best lunch spots around. A few years back someone christened it All Mountain, then it was Backcountry. Now it’s all Enduro, Enduro, Enduro. We’ve always just called it mountain biking in The Alps. Read about our ‘regular’ riding and other special biking weeks. 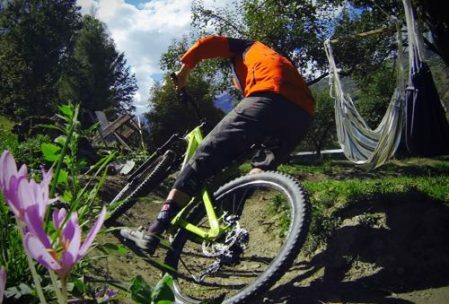 The mountain biking around BikeVillage and Les Arcs is ridiculously good. There are so many trails we could ride from our door, and do something different every day for months on end. 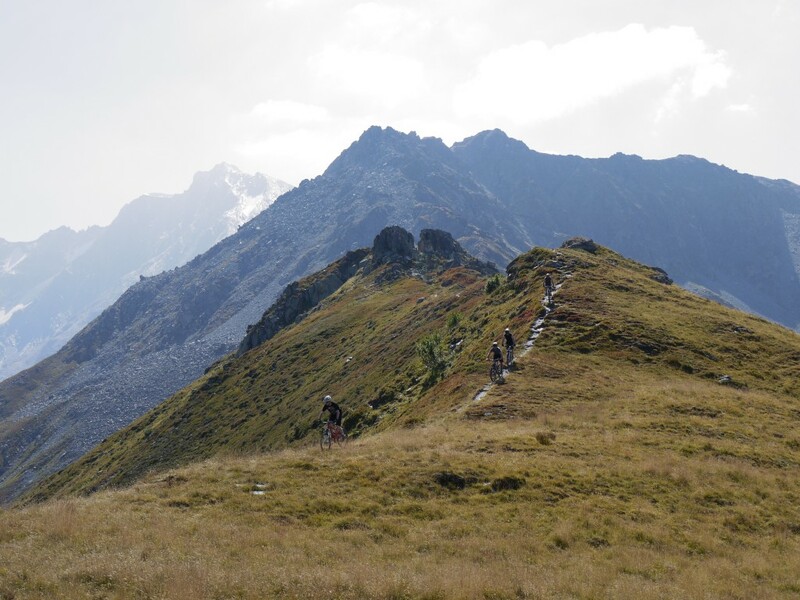 There’s the high level (2000m+) super flowing singletrack above the tree line, with amazing views onto Mt Blanc and all the other surrounding peaks. Then there’s the tighter, cheekier singletrack down in the woods below Les Arcs and La Plagne. With more switchbacks than you could possibly count. Cross to the Beaufortain Alps and it’s a more open, almost Mediterranean feel, to the biking with more rock slabs and faster flowing trails. We have reopened and continue to maintain many of the local trails with our own fair hands (never leave home without a pruning saw, loo roll and a trenching tool) and so are pretty used to having them to ourselves. 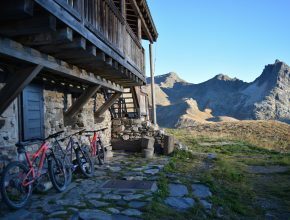 We’ve been proudly running our mountain bike holidays in The Alps, near Les Arcs for nineteen years solid and we still find new trails all the time – that’s part of the reason so many BikeVillage guests come back on holiday again and again, to mix some old favourites with our latest singletrack discoveries and creations. It’s not just the trails that set us apart from other mountain biking holiday companies. Along with our passion for the mountain biking comes our dedication to tailoring the experience to each rider. We only take up to 14 guests a week. There are two or three different rides each day. The guides are all fully-qualified professionals too, up to the rigorous French standard, which involves 1200 hours of training. They earn a full time living by making your riding experience the very best it can be. Head guide Sam, as president of European guide organisation EO-MTBing, is one of the most experienced mountain bike guides in the world. No gap-year kids here, just mature professionals with a passion and drive based solely around your safety and enjoyment. Each day we’ll talk through the options with you and help you pick the best trail for that day. It might involve a free uplift or a helping chairlift. The idea is that you’ll always be doing the sort of riding you love best at the sort of pace you love best, even when the group as a whole has differing aspirations on these fronts. All this really helps mixed groups to share lots of fun together whilst also fulfilling more selfish ride needs! Do you feel the need to express your inner redneck? To leave the soap and the stress far behind? Well the good news is that BikeVillage specialise in optional Alpine hut trips. They are 2-day hut trips, usually taking place on the thursday-friday of your BikeVillage week. We set off on Thursday morning with a van uplift and put in a big day on the bikes before finishing at an alpine mountain refuge. Just to be open about this, if the refuge is above 2000m altitude, which most of them are, then day 1 will either finish with a climb or at least involve a climb late-ish in the day. We then eat, sleep and be merry in the refuge. Think Youth Hostel on top of an Alp rather than bothy and you’re on the right track. The refuge guardian will cook us dinner and make us breakfast. There will even be beer and wine available to buy. On day 2 we set off on some more alpine adventuring, this time with the smug certainty that we are at the top of a mountain and so the day’s profile will feature significantly more down than up. There are hundreds of possible trips to do in the area so we’ll pick what seems best based on the weather, conditions and group. There is a hut trip option to click on the booking form if you would like to provisionally book one during your trip. Cost: the hut trip option is €95/person, which includes van uplifts, accommodation and meals. It doesn’t include the beer and wine you drink at the refuge, which will be paid for directly at the refuge. A second day of clothes, or just fresh shorts or just go full grot-bag and wear it all again. Toiletries, including sun tan lotion. A super-light pack towel – they have showers. Something warm for the evening – tights, hat (one that fits under a helmet is a good double-up item) and warm LS top/lightweight down top as a minimum. Any extra snacks for day 2. We will also give you sheet sleeping bags to carry, unless you bring your own. A 20l+ riding pack is pretty much essential to carry all this comfortably. Think about options to stash some weight on your bike too. Your OCD – go light! You want enough kit to cope with weather extremes but beyond that the less you have on your back the more fun your riding will be. When we say pack towel, we mean pack towel not beach towel. When we say sun-tan lotion, we mean a tiny bottle rather than a family pack. Chop the handle off your tooth brush, weigh your hat collection. Go nuts! 300g saved at home will have a real impact on your trip. The hut trip booking option is a provisional one. We need a minimum of 5 guests to be up for it to be able to go ahead and, more importantly, we need fairly decent weather. If the forecast is rubbish we aren’t going to flog you up a mountain just to have to set off the next morning in cold wet kit. We’ll just stay nearer to BikeVillage base and fire up the wood burner instead! First things first – these are not female only weeks. They are totally ‘regular’ BikeVillage weeks where we try to concentrate bookings from our female riders. Mountain biking can be a bit male dominated and a frequent concern with female riders is that they’ll be stuck on holiday with a load of men. Happily, these weeks have become less important over the years as our sport gradually modernises its demographic – even on regular weeks we average 30% female guests. Our female friendly weeks simply aim to amplify this ratio a bit. The idea is to provide weeks where a modicum of female company is guaranteed. Chaps are still welcome and the riding options remain as flexible as ever, there’s just better chat at the table and slightly less testosterone floating about! See the dates & prices page for details of when they’re on in 2018. Our normal weeks are pretty much adult affairs, even if the chat is often infantile. Our new Family week is aimed at regular mountain bikers who still want a great biking trip rolled into their family summer holiday. We can help arrange child care and fun activities (go-ape, horse-drawn cart rides, swimming, hikes, donkey rides, the list goes on and on) for younger kids and, accompanied by their parents, some biking for the slightly bigger ones. You’ll have the choice of disappearing on a backcountry adventure knowing that your little ones are having as much fun as you or else sharing the fun by riding/playing out with them. We can also run half day rides to give us the best of both worlds. We keep it all in one week so that the kiddos can meet new friends and because that’s about as long as Sam can keep his dinner table banter relatively clean for*. It’ll stop you feeling at all self conscious at the dinner table too because there’ll be total carnage everywhere! In fact we are able to offer great prices for the kids because of the saving we make on dog food as Rocket cleans up around the table. *there will still be swearing. 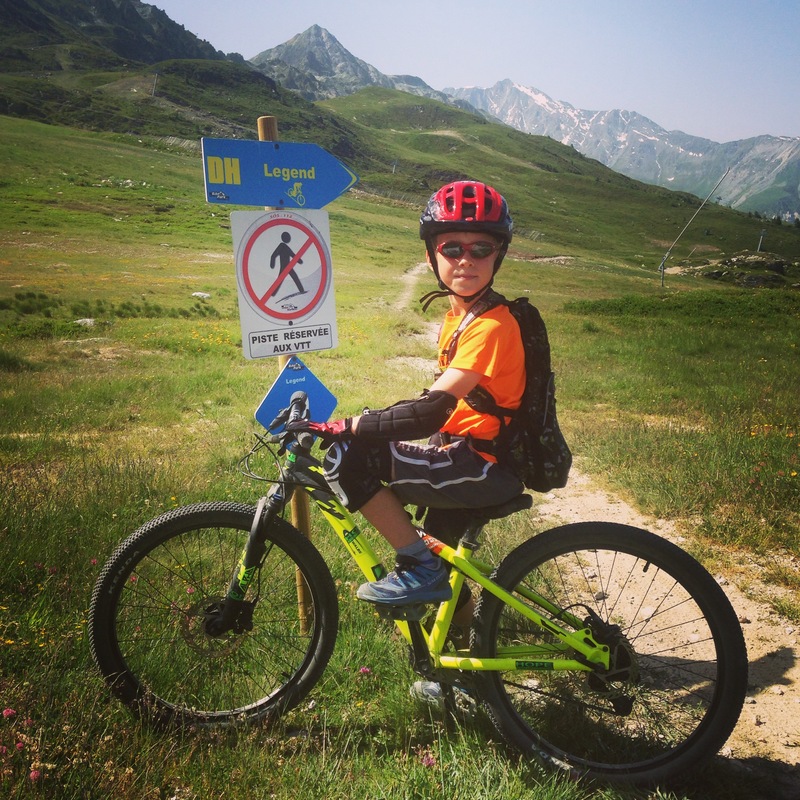 Alpine Skills Weeks – fine for ‘normal’ riders too! 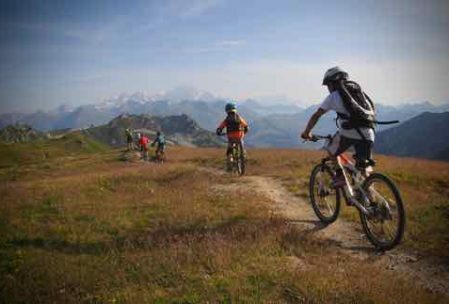 Feeling a bit imtimidated by the thought of a mountain biking holiday in the Alps? So you should be! Every week at BikeVillage we offer lots of help and tips to bring on your technical riding. During our skills weeks it’s just a bit more structured. From a first day introduction to the area we’ll develop your skills plan for the week, usually covering body position, braking, hopping off safely in steep terrain, cornering and those pesky switchbacks (different to normal corners). Over the week you should transform into a riding God! Sorry, got a bit carried away there. These weeks are perfect for intermediate riders who have experience on natural and MTB centre trails (let’s say red ones) at home and would like to develop their skills on more demanding terrain. If you think a BV trip might be too much then these are the weeks for you. The rise of enduro racing these last few years also now means there are lots of good quality, unobtrusive and lightweight knee and elbow pads on the market. They’ll help with your confidence during the rides and stash easily in backpacks for the climbs. One word of caution though – these weeks are aimed at fast-tracking your riding skills to cope with alpine terrain. If you’re happy with a steepish learning curve (we’re very patient and we love skills coaching) and the odd crash, come along! However, this is still The Alps. If you’ve ridden off road for years and simply prefer less technical riding, maybe consider somewhere a little less pointy, geologically speaking. We’ll tailor the trails as much as we can but the idea is to bring your riding up to the challenge of the Alps and not vice versa. Also, you must be sure enough of the skills you already have that you are able to decide which obstacles you want to ride and which you’d be better off walking – the final call will always be yours! If you have any questions about the riding then please do give us a call/email – it’s a subject we are more than happy to chat about at great length!